It’s another holiday! Today is Gandhi Jayanti, celebrating the mahatma’s birthday. After a very long wait between Good Friday (6th April) and Independence Day (15th August) we’re now into the best season with 3 holidays in October and 2 in November this year. It’s pretty disruptive to the teaching–our 4th term of the year starts in college this week–but very welcome nonetheless. One of the big surprises about moving out to India is that I’ve become a morning person. (Or it could be my middle-aged hormones kicking in.) 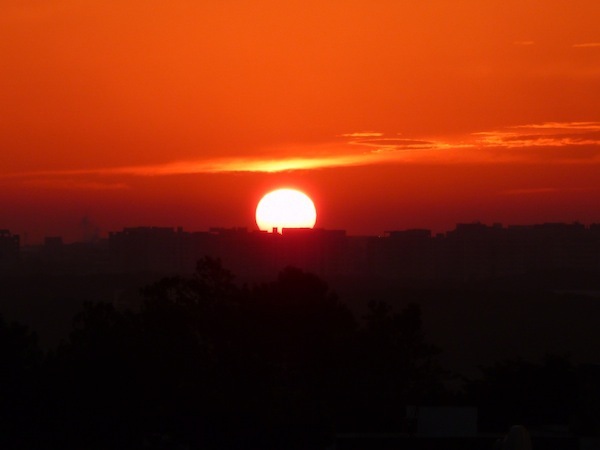 This morning I was suddenly wide-awake just before dawn, around 6 O’Clock, so I got up, made a cup of coffee and enjoyed the spectacular sunrise. And especially the peacefulness–being a holiday there wasn’t a single car on the roads, and not a honk to be heard. I have a great East-facing flat here, usually filled with sunshine right after sun-up, and somehow I’ve got used to harnessing that energy. Having a day off meant being able to do nothing, which today was pottering about in the small garden on my balcony. I’m a big fan of gardening but before moving to India I ended up with 13 years of not having any outdoor living space at all. Mind you, with the Scottish weather that’s not such a big deal. But moving out here and being able to enjoy Bangalore’s climate made me all the more enthusiastic to get my green fingers up and running again. 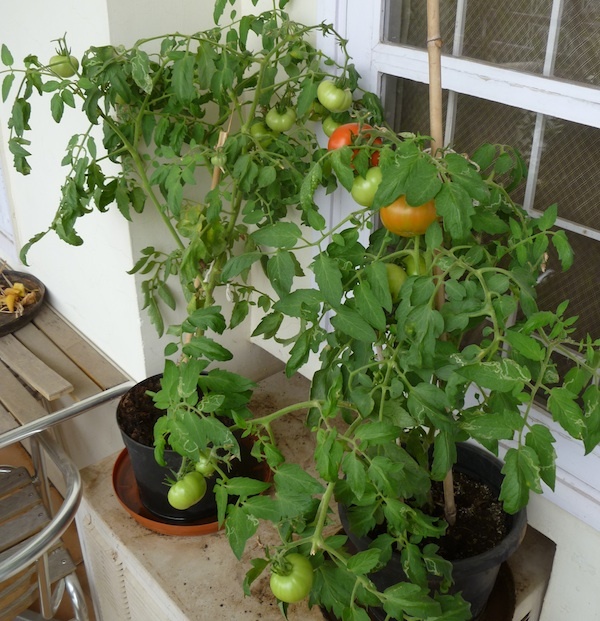 In my previous Bangalore flat I had a lot more space and grew quite a few vegetables, but here I’ve been mostly cultivating tomatoes and a few herbs. Even then, the tomatoes haven’t been a huge success due to the troop of Macaques that hangs around, and comes raiding the apartments on a regular basis. Once they’d discovered the tomatoes the same routine would play out again and again… I would hear a thud as something obviously heavy lands on the garden table; I would look out the window to see a big fat grey-haired monkey chewing on a green tomato; I would open the doors to shoo it away, and it would just look at me as if I were insane; and then I would throw some water at it and it would leave, looking quite surly but not at all afraid. 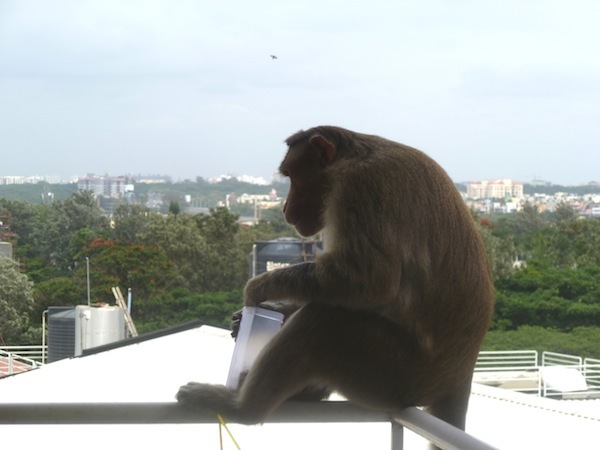 A few weeks back the monkeys started to become quite a nuisance generally, and an e-mail debate raged on our residents’ association mailing list, with the subject “Monkey Menace”. The “against” camp were suggesting that monkey-catchers should be called in to get rid of them (they’re in the phone book, as are snake-catchers). Someone even recommended hiring Langurs–which are actually another type of monkey! They are sometimes trained to scare away other, more mischievous primates, as with the 2010 Commonwealth Games in Delhi. And the “for” camp were pointing out that they were god’s creatures and had every right to be here. The residents’ main concern is that the monkeys will come into the apartments through any open doors or windows, usually to steal food. And it appears that monkeys really do love bananas in real life, not just in cartoons. Slightly more worrying if you have young children though. A couple of weeks ago I heard shouting coming from next door and looked out the window to see a large male walking along my railings carrying a tupperware box. (Tupperware is something else that features heavily on our mailing list.) He sat down, oblivious to the shouting and stick-waving coming from next door, popped the top rather expertly from the tupperware box and started eating the nuts or biscuits or whatever was inside. In the past week the air during the day has been filled with hundreds of dragonflies, flitting back and forth right next to the balcony. I can’t imagine where they come from… back home I would associate them with ponds, and even then you would only usually see one or two together. 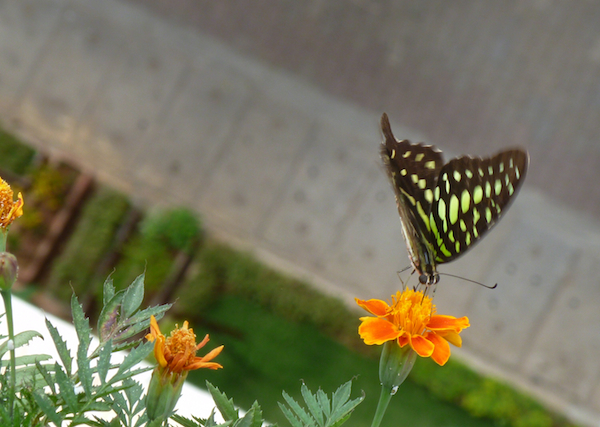 I also get some amazing butterflies coming to visit, although they’re very difficult to photograph because they come and go so quickly, and never stay still for long. Recently there’s been a little Palm Squirrel visiting, and he’s awe-inspiring to watch because he runs and leaps in such a death-defying way… considering he’s only 6 inches tall and I’m on the 7th floor, the view down from the handrail doesn’t seem to phase him at all. And there are lots of birds too, particularly Kites, the large birds of prey that are often mistaken for Eagles, but which are actually scavengers rather than hunters. 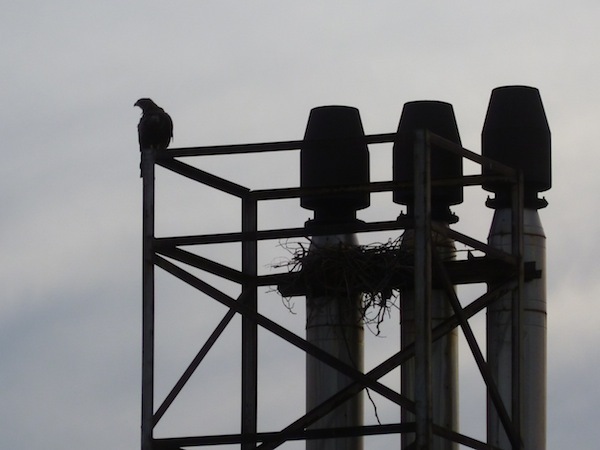 A pair of Black Kites has just started building a precarious-looking nest in one of the generator-chimneys that’s next to where I live. I’ve seen them foraging for twigs, some of them more like small branches, and swooping around carrying them in their talons. I’m looking at the nest right now. I don’t have a great zoom on my camera, but hopefully should be able to see any chicks when they arrive. It’s been great having this outdoor space, and I will really miss it when I inevitably leave. Still, I thoroughly enjoyed building up the garden from nothing in the previous flat, then shifting it all here and continuing to build my own little piece of jungle, even though it’s only temporary. As I’ve said before, working abroad is a bit like life… you arrive with nothing and you leave with nothing. So you just make the most of what you have while you’re here. Chris, I stumbled upon your blog post when I was searching for the meaning of the word pourakarmika and got addicted to your blog. I read through all your posts from Nov 2010 till this post in a single day (which is a big deal for me as I am not an avid reader) and it gave a great feeling of reading a novel. Your writing style is excellent. It was exciting and very interesting to understand your view of India and in particular Bangalore. I myself feel a bit of alienated here in Bangalore as I am from Tamil Nadu. I am very happy that you like being in India. Keep blogging.